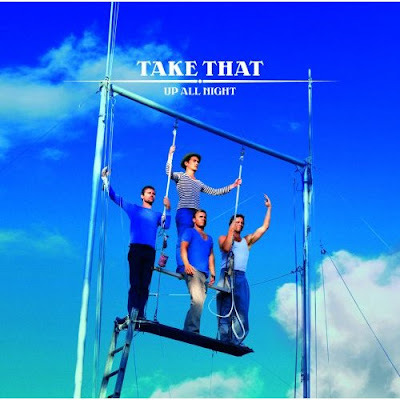 Take That gave their core fanbase (read: thirtysomething British women and gay men around the world) a Valentine's Day jolt in the shorts today with info on their upcoming single, "Up All Night." The cover art was e-mailed out by the band's label, and it keeps with the trapeze theme of the That's album The Circus. Also included was the fact that the single—out March 2 in the U.K.—will include the new song "84" as a B-side. I like to think 84 is the number of times Howard Donald has banged Jason Orange in the back of the tour bus over the years. You know, a romantic ballad. And then Gary Barlow walks back there to make eggs in the kitchenette and sees them is all like, "Guys, what are you doing? That's nasty!" and they're like, "Shut up and hop on, mate!" and Gary's all like, "Well, the wife is in the Canary Islands for the week. And what happens in Cornwall stays in Cornwall, right lads?" Then they all do boy band stuff with their mouths. Voilà...instant B-side! Happy Valentine's Day! Hot scenario, but I've heard "84" -- it's actually a bitter rant about Ian Levine, and the title is his real age. "then they all do boyband stuff with their mouths"
XO, I got skillz. Don't doubt it. Moog, Take That's Ian Levine connection constantly amuses you, doesn't it! Is Vince Clarke Banging The Saturdays Or What?